Quezon City, 8 November 2016 — Professor Leo D. Battad, Officer in Charge of the Institute of Human Rights at the University of the Philippines Law Center, delivered the Class of 1957 Professional Chair Lecture in Government. 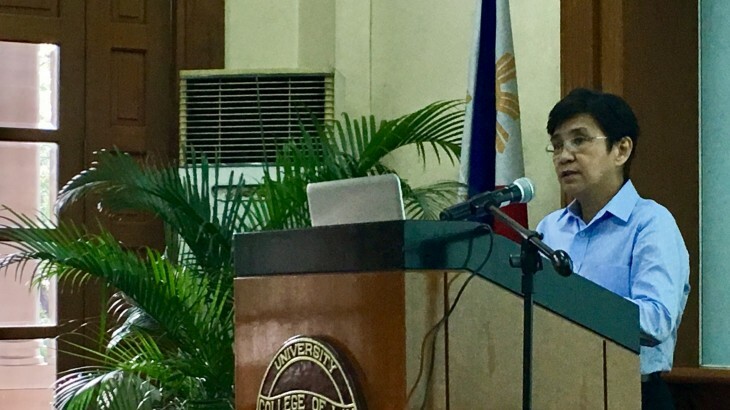 Entitled “Precarious Employment in a Globalized World: The Case of Non-Regular Employment in the Philippines,” the lecture traced the trends in modes of production that legitimized the practice of hiring non-regular employees. These models included the post-Ford model that emphasized specialization and flexibility, and lean production model, which stressed just-in-time practices and waste elimination. To meet the demands of the market and the economic interest of the employer, employers began favouring a flexible workforce over a regular one. Non-regular employees include those who are hired on a contractual/project-based, seasonal or casual basis. Professor Battad then gave proposals for better protection of the labour force. This included clarifying labour laws and providing more detailed operational definitions regarding the nature of work that should not be considered as non-regular because the work is necessary or desirable in the usual business or trade. She also suggested that there should be measures preventing abusive renewals of fixed-term contracts, setting a maximum duration for non-regular employment, and providing limited and objective justifications for hiring fixed-term or non-regular employees. Other proposals included clarifying and limiting the use of outsourcing, and defining and clarifying the relationship between subcontractors and principal employers as well as their respective liabilities. Professor Battad also argued that labour-only contracting should be prohibited in the law. Finally, the Professor stressed the need for better monitoring and inspection of workplaces. Battad stated that labour and union organizations should coordinate with labour inspectors and actively participate in labour inspections. In light of the ASEAN integration, Battad and the participants expressed the hope that the region would eventually move towards harmonization of labour laws in order to ensure that workers, especially migrant ones, are protected across the ASEAN. ASEAN, Business & Human Rights, News, Philippines. permalink.